Ian is an Associate Minister at St Andrews. He came to Hong Kong with his wife Narelle in 2016. They were both born in Australia and have served in churches on Norfolk Island, in Sydney at a University College and in Jakarta Indonesia. They have an adult daughter; Beth. 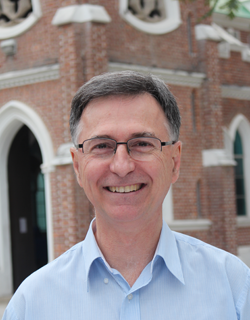 Ian studied at the University of New South Wales and at Moore Theological College. His passion is seeing people living out their Christian faith, despite difficulties. He likes watching movies and sport and going on walks in Hong Kong with Narelle.